1. Are you fully insured and bonded? Yes, we are always able to provide proof of the insurance certificate for each project. Please request this information when signing the contract. 2. How long is an average concrete project? 3. What affects the pricing on stamped concrete on projects? We have a standard price, but due to the unique details of each project there are some additional items that may cost more due to the complexity of the work. Stained or non-stained edges, medallion install, drainage changes, sprinkler moving and capping, sealer additives, steps, individual staining, special stamping techniques and face finishing are all examples of special situations. Call for more details. 4. How slippery is decorative concrete? Stamped/decorative concrete is no more more slippery than tile, laminate or wood when wet. However, for a reasonable cost, we can offer a skid resistant additive to your concrete. 5. What is the average thickness of decorative concrete? 4-8 inches depending on the project. 6. Is stamped concrete easy to maintain? Yes! Stamped and decorative concrete is easily maintained as long as it is maintained properly, which includes periodic re-sealing. Call us today for additional details. 7. 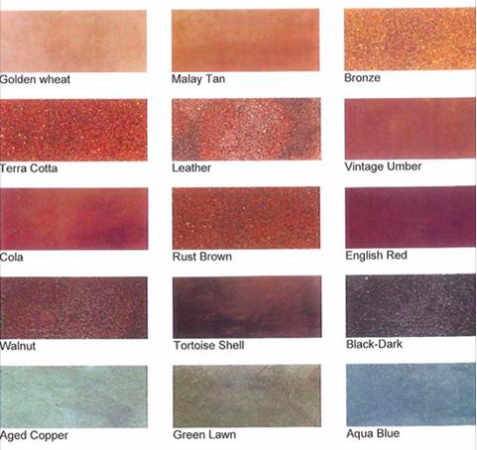 Where is your stamped concrete made? We use US-based concrete products provided by Advanced Paving Co. and never skimp on quality. You're in good hands!